A slow-paced allegory about the effects of radioactivity conveyed via a disconcerting clash of plot elements from both the crime and science fiction genres. A drug deal gone wrong. A suspect disappears leaving behind only his seemingly discarded clothing. A “ghost ship” where all on-board have disappeared leaving only their clothes behind. Fishermen killed and dissolved by a gelatinous green-glowing living liquid. H-Men who dissolve anyone they touch. H-Men who it is believed still inhabit the sewers of Tokyo. H-Men who it is feared will once again emerge to kill all the citizens of Tokyo. H-men who still instill fear in the hearts and minds of the Japanese population sixty years later. What started off as just an unusual murder mystery eventually grew into something that seems to have been the product of someone’s wild imagination until it eventually captured the collective imagination of an entire population over the course of many decades. 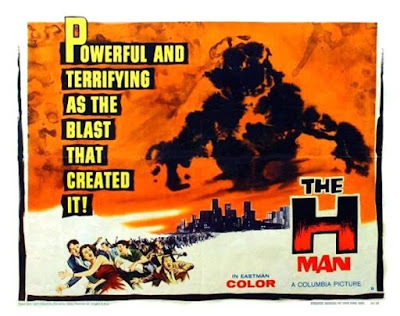 The modern myth of “The H-Man “ literally exploded onto the scene with the US hydrogen bomb tests in the 1950s. Added to this was the fact that Japan was only just recovering from the destructive effects of both the Godzilla and Rodan monsters. Is it any wonder then that within the context of a climate of fear, the Japanese psyche became susceptible to rumours and stories involving supernatural, paranormal and otherwise life-threatening, inexplicable and devastating occurrences? The following account has been pieced together from police records and the recollections and testimonies of surviving eye-witnesses. The story began one night on a rain swept street in Tokyo. As a criminal by the name of Misaki was in the process of loading something into the back of a car, he suddenly began to scream out in pain and fire his gun. An accomplice by the name of Uchida quickly drove off leaving Misaki in the middle of the street where he was then hit by a taxi. When the taxi driver went to investigate, all that was found was Misaki’s clothes laying in the street. What had happened to Misaki’s body? The next day at the local police station, narcotics were discovered among Misaki’s belongings. Misaki apparently had obtained the drugs from a locker rented by a “foreigner” named Mr Chin. It was Mr. Chin who identified Misaki as the man who had given him the drugs. When the police went to Misaki’s apartment to arrest him they found only his wife, Chikako, a beautiful night club singer. Chikako told the police that she had not seen Misaki for days and didn’t know what he did for a living. The police decided to let her go hoping that this would draw Misaki out of hiding. While Chikako was performing at the club, someone attempted to make contact with her in the hope of obtaining information about Misaki. After his arrest by the police it was discovered that the man was a respected scientist by the name of Dr Masada. He was apparently conducting research into the after-effects of atomic explosions. He conjectured that on the night that Misaki disappeared, the rain may have been radioactive and that Misaki had, as a consequence, dissolved. He also believed that Misaki may have been on a Japanese ship that had sailed too close to an atomic test conducted on Bikini or Christmas Island. Masada must have seemed like a crackpot to those who heard his theories. In the meantime, it turned out that Chikako had a strange experience upon arriving home that night when she was assaulted by a gangster from a rival gang looking for Misaki. Chikako had observed the intruder exit through an open window, but investigating police found only another complete set of clothes – once again minus a body. Dr Masada fed more fuel to the fire of fantasy that seemed to be steadily consuming this strange case. He related to the police stories he had heard of men dissolving, and that he had eyewitnesses to just such an event. Two eye-witness fishermen recounted their experience of encountering a ship that had been abandoned at sea which they boarded with a group of other men. Their exploration of the ship yielded no evidence of the crew but instead they discovered piles of abandoned clothes. In the captain’s cabin, as one of the fishermen set about pilfering some articles of clothing, a strange mass supposedly emerged out of the darkness and dissolved him, leaving only his clothes. Only two from the original boarding party made it back to their ship. The Captain would not believe their story, that is until strange green shapes were seen moving around on the “ghost ship.” It was the entries contained in a log book from the strange vessel that seemed to confirm to Masada his theory about the atomic blast being able to melt people. Masada showed the police an experiment he had been working on that involved the use of intense radiation to melt objects. By way of demonstration he subjected a frog to radiation which did in fact dissolve the hapless creature. Masada apparently went on to demonstrate that the frog in its altered state was still capable of killing and absorbing things. From the evidence thus far, it was concluded that Misaki had met the same fate as that of the frog and the dead fishermen. Furthermore, it was believed that portions of the abandoned ship had washed into Tokyo harbor, and that the “H-Men” creatures must’ve been loose in the city of Tokyo. From this point on, it is difficult to disentangle fact from fiction. It is almost as if there has been process of cover-up. Many of the records and reports from the time of the “H-Men” incident have simply disappeared. Freedom of information requests have produced little in way of verifiable evidence with most existing documents and files having been heavily redacted. Most of the principle participants in the whole affair are either dead now or have simply disappeared, their whereabout presently unknown! A gun-fight apparently continued at the site of the club and when the smoke settled all the gangsters both alive and dead had been accounted for. Rumours persisted for quite some time afterwards that the police officers had been firing at a number of “H-men” as they began infiltrating the club site. Interestingly enough, an article in the Yomiuri Shinbun reported on Dr Maki’s findings that the creatures labelled “H-Men” were not just killing their victims but were also eating them as well. Of course, such reports have since been deemed as being just a hoax perpetrated by those wishing to cause mischief. As an interesting aside to the events described here, it has recently been learned that the now deceased Masada was considered as a possible candidate to receive the medal of honour. The reason for this can be revealed with a measure of confidence. It seems that Uchida had escaped the scene of the club shootout and had kidnapped Chikako. Masada gave chase in his car when he realized this but crashed allowing Uchida to escape with his captive. From there Uchida took Chikako into the sewers where there was a hidden stash of heroine. Masada, meanwhile had worked out where Chikako was when he found her clothes outside a sewer exit in the river. Now why were just her clothes found? Conspiracy theorists have speculated that the sewers in fact contained the lair of the “H-men” and that having realized this, Uchida ordered Chikako to remove her clothes hoping that the police would think that she had been killed. Perhaps they are right. They also point out that at the time an operation was being carried out at the underground sewers that involved the use of burning gasoline. They claim that a plan had been drawn up to use a combination of electricity and fire to destroy the “H-Men” creatures that had taken up residence in the sewers under the city. When Masada found Chikako’s clothes, preparations had just about been completed by the authorities to begin their assault. Official statements would later contradict such a scenario by explaining that the burning in the sewers was caused by a methane gas-type of explosion caused be an undetermined ignition source. It may have even been the result of unstable geo-thermal and seismic activity. Whatever the cause, personnel were sent into the sewers to try and stop the flames from spreading and allow the fire to burn itself out. 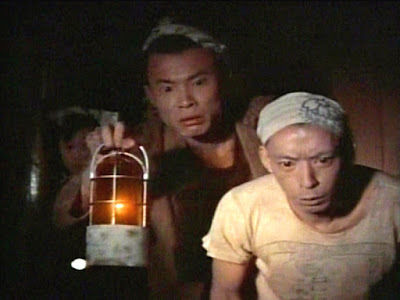 It has been assumed by some commentators that Uchida had been attacked and killed by the “H-men” in the sewer tunnels. Luckily Masada heard Chikako’s cries of help and just managed to rescue her as the flames worked their way through the tunnels. Was this indeed the case? Had the “H-men been trapped and destroyed by the flames? Or is the ongoing belief in the “H-Men” just another urban myth, a kind of allegory warning us about the consequences of continuing to test and explode H bombs around the world? Could perhaps the “H men” ultimately return and rule the world? 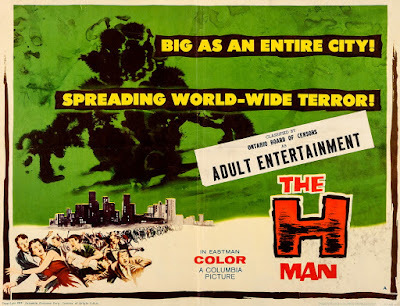 The H-Man was distributed theatrically in Japan by Toho on June 24, 1958. It was released theatrically in the United States by Columbia Pictures with an English-language dub and 79 minute running time. 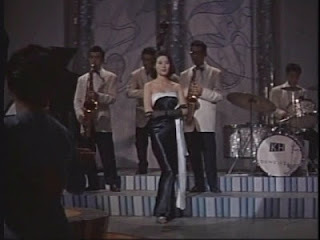 It was part of a double feature with The Woman Eater (1959) and released on May 28, 1959. Notice how much fuss was made over the fact that Chikako owns a television set. At the time this kind of purchase was a significant expenditure for the average household. The dissolving effect involved deflating life-sized inflatable human figures, filming them in fast-motion, and then running the film at normal speed. This cheap process is quite skin-crawlingly effective as we witness the victims slowly turning into puddles of glowing slime – a convincingly horrible, slow, messy but bloodless process. In some ways The H-Man is reminiscent of the classic 1950’s film, The Blob, but it did come out a bit earlier than the latter film. Unlike the Blob creature, the “H-Men” appear to have human-like characteristics and intent. The H-Men creatures turn out to be scarier than the Blob when it’s obvious that not only are they intelligent but were at one time one of us. 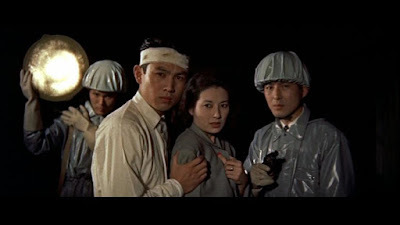 There are also echoes of Godzilla where in that movie a fishing boat had strayed too near a nuclear test at Bikini Atoll, causing the crewmen to become sick due to fallout. 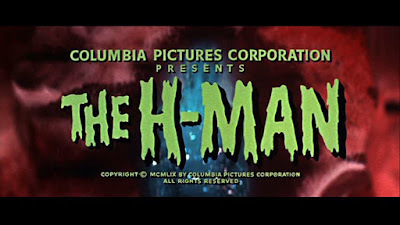 In the H-Man, nuclear test fallout cause the crewmen of a boat not just to become sick but to become liquified and transformed into a dangerous new form of life. 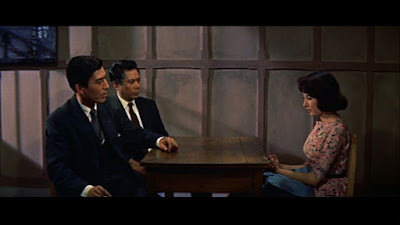 The crime melodrama element takes up a significant amount of the plot before introducing the science fiction / horror notion of Tokyo being stealthily invaded by malevolent mutant H-men. It is difficult to determine what the H-Man is purporting to be: a monster movie or an American-style film noir crime drama. It is difficult for the viewer to be sure why police are investigating the nightclub and how this relates to the abandoned ghost ship at sea and the H-Man causing people to disappear. The end result is that he viewer’s patience is really tested as he attempts to wade through a rather slow-moving plot before the pace begins to pick up leading up to the rousing climax in the sewers. It has been sixty years since The H-Man was released and for a large part of that time we have been asleep snug under the covers of complacency when it comes to the dangers posed by nuclear radiation. Setting aside near nuclear power catastrophes such as Three Mile Island, Chernobyl and Fukushima, we still have the ever-present danger of nuclear arms proliferation and the possibility of such weapons being deployed. The bellicose sabre-rattling centring on the North Korean regime’s nuclear weapons testing and armament has set off alarm bells around the world. So have “fire and fury” pronouncements emanating out of Washington along with suggestions aimed at “modernizing” nuclear arsenals and the possibility of engaging in limited so-called winnable tactical nuclear strikes. The H-Men do indeed stand poised…. The H-men does indeed highlight a particular technological development and the effect it can have on individuals and on humanity itself. It is worthwhile to step back from some of the major technological advancements we have incorporated into our lives and consider what effect they might be having on our thought processes, psychological well-being, personal and social relationships, personal liberty, security and safety, individual freedoms and privacy, the democratic process, morality and ethics and even what it means to be human.